The city of Carmen, Don Juan & Figaro, rich Moorish heritage and an important harbor during the Spanish conquest of the Americas, Its rich history has left immeasurable monuments: the Cathedral, Giralda tower, Reales Alcázares, Casa de Pilatos, Torre del Oro, the Town Hall, Archive of the, the Fine Arts Museum, the magical Barrio of Santa Cruz (with its narrow streets, flowered balconies & hidden patios), and the passion for Flamenco and the perfume of orange blossoms on every corner. The Sevillians are known for their wit and sparkle, the city itself is striking for its vitality. 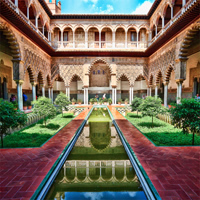 An incomparable adventure through the most popular cities in Spain, by flight and trains! First, visit Madrid (Golden Triangle of Art: Prado Museum; Reina Sofia and Thyssen-Bornemisza Museums; its famous nightlife and buzzing energy); Seville (The Cathedral, Alcazar, Archive of the Indies, Barrio Santa Cruz), and Granada (The Alhambra, The Cathedral, Albayzin) with the AVE Train then fly to Barcelona (stunning architecture by the world famous Gaudi, the Gothic Quarter and always in the biting edge of fashion, food, music and good times).This is a flexible vacation package. Select your number of nights in each city, desired hotel and activities. 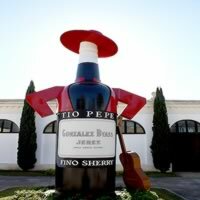 This self-drive, independent vacation package will introduce you to all the most breathtaking aspects of Spain. The atmosphere is dynamic, the cities are lively and the countryside is stunning. 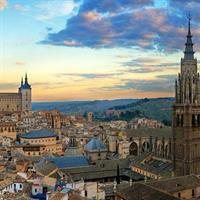 Start with a visit to exciting Madrid (an undeniable energy permeates the air, the food is heavenly and the museums are out of this world) then pick up your car for a short ride to historical Toledo (a UNESCO World Heritage site which has hosted various cultures and religions throughout its storied history). Continue to sophisticated Seville (rich in Moorish heritage, stunning monuments dominate the skyline, the passion of the Flamenco dance and the scent of orange blossoms in every quarter) and onto Granada (the palace and gardens of the Alhambra, the city is littered with influence of Renaissance, Baroque and Neoclassical elements). From here you drive to Valencia (the gateway to the Mediterranean; where history meets modernism - theater and cinema, commerce and culture blend in the presence of stunning beaches) and finally end with a visit to cosmopolitan Barcelona (featuring the awe-inspiring architecture of artist Gaudi, a vibrant nightlife leading the world in areas of fashion, food and music while celebrating its own unique identity). This is a flexible vacation package. Select your number of nights in each city, desired hotel and activities. 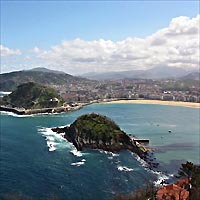 Spain is one of our most popular destinations in Europe, and this vacation package will take you along some of the highlights of this stunning country! Visit Madrid (Golden Triangle of Art: Prado Museum; Reina Sofia and Thyssen-Bornemisza Museums; its famous nightlife and endless energy); Cordoba (Mezquita, Juderia, Alcazar and its beautiful patios); Seville (The Cathedral, Alcazar, Archive of the Indies, Barrio Santa Cruz) and Granada (The Alhambra, The Cathedral, Albayzin) with the AVE Train.This is a flexible vacation package. Select your number of nights in each city, desired hotel and activities. On the banks of the Guadalquivir, Seville is filled with life. The Sevillian people are known for their wit and sparkle and the city itself is striking in its vitality. 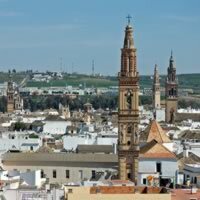 Part of its treasures include the minaret of La Giralda, the cathedral, and the Alcázar Palace, Casa de Pilatos, Torre del Oro, the Town Hall, Archive of the Indies plus convents, parish churches and palaces. Spain is one of the most popular destinations in Europe, and this vacation package will highlight exactly why with visits to Madrid (featuring the Golden Triangle of Art: Prado Museum; Reina Sofia and Thyssen-Bornemisza Museums; its famous nightlife and endless energy are intoxicating), Seville (a rich Moorish heritage, the passion of the Flamenco and the perfume of orange blossoms in every corner) and Granada (a historic Moorish-Christian artistic heritage and a UNESCO World Heritage site). Travel by train between cities. This is a flexible vacation package. Select your number of nights in each city, desired hotel and activities. 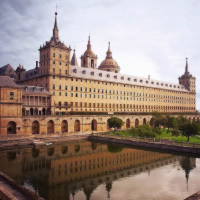 Spain is recognized throughout Europe for its distinctive style and contribution to art, history and food, these 2 cities highlight that commitment. 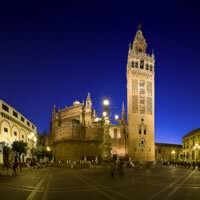 Visit Madrid (featuring the Golden Triangle of Art: Prado Museum; Reina Sofia and Thyssen-Bornemisza Museums; its famous nightlife and endless energy) and Seville (with lively flamenco, the stunning Cathedral, and historic city center). Travel between them with the new HighSpeed train. This is a flexible package. Select your number of nights in each city, desired hotel and activities. Take an inspiring, once in a lifetime trip to Europe and visit Barcelona (famous for architecture by Gaudi, the dramatic Gothic Quarter and innovative fashion, food, style, music and incomparable good times), then catch the train to Seville (with its own stunning cathedral, and architectural savvy, the home of Flamenco does not disappoint). This is a flexible vacation package. Select your number of nights in each city, desired hotel and activities. Take a whirlwind, once in a lifetime trip to Europe and visit Barcelona (known for its art and architecture. The fantastical Sagrada Familia church and other modernist landmarks designed by Antoni Gaudi dot the city), then catch a train to Seville (It`s famous for flamenco dancing, particularly in its Triana neighborhood. A major landmark include the ornate Alcazar castle complex, built during the Moorish Almohad dynasty), then pick up your car for a stay at the beautiful Costa del Sol (miles of sandy beaches, tons of sunshine and stunning views over the varied landscape). This is a flexible vacation package. Select your number of nights in each city, desired hotel and activities. 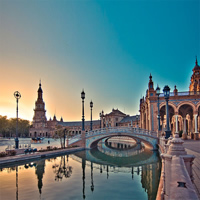 Start with a visit to exciting Barcelona (Gaudi, Gothic Quarter and always in the biting edge of fashion, architecture, food, style, music and good times), then catch the train to Seville (It`s famous for flamenco dancing, particularly in its Triana neighborhood. A major landmark include the ornate Alcazar castle complex, built during the Moorish Almohad dynasty) and then pick up your rent a car for a visit to the Costa de la Luz (a section of the Andalusian coast in Spain facing the Atlantic). This is a flexible vacation package. Select your number of nights in each city, desired hotel and activities. 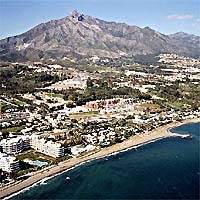 Enjoy picturesque Spain with this vacation package, begin with a stay in beautiful Seville (fragrant orange blossoms and the passion of the Flamenco waft through the air) then visit Granada (with a strong artistic and cultural heritage; Moorish and Christian details dominate the city) and finally Marbella (typically Andalucian with whitewashed houses, beautiful beaches and countless attractions set on the Costa del Sol). A rental car allows you to take your vacation into your own hands! This is a flexible vacation package. Select your number of nights in each city, desired hotel and activities. Start your visit with a stay in beautiful Seville (fragrant orange blossoms and the passion of the Flamenco waft through the air) then pick up your car and continue on a journey through the White Villages. Visit Arcos de la Frontera and its surroundings, continue to impressive Ronda and finally, end with a relaxing stay in the Costa del Sol. 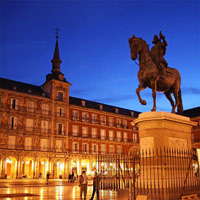 This vacation package focuses heavily on the very picturesque regions of Spain, almost like driving into a postcard! This is a flexible vacation package. Select your number of nights in each city, desired hotel and activities. 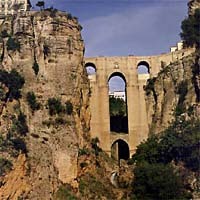 Focus your visit to Spain around the hightlights of Andalucia! Visit Granada (the last kingdom to have been recaptured by Catholic Monarchs, this city has an incredible Moorish-Christian historic and artistic heritage); Cordoba (known for its poets and philosophers; with 3 recognized UNESCO World Heritage sites this city represents the very essence of Spain); Seville (the city of Carmen and Don Juan; with rich history and inspiring monuments, the passion of the Flamenco and the fragrance of orange blossom lingering in the air); and Ronda (situated along a gorge in a mountainous area, this `pueblo blanco` with a historic bull ring is beautifully preserved with great bars and restaurants) and the Costa del Sol (miles of sandy beaches stretch along the Mediterranean sea, with extensive leisure and sport activities; this area has earned its name with over 250 days of sunshine per year). This is a flexible vacation package. Select your number of nights in each city, desired hotel and activities. Combine Madrid, Toledo, Sevilla, Marbella, Granada, Valencia and Barcelona with a rent a car. Visit Madrid (museums and nightlife), Segovia (Roman Aqueduct), Toledo (historic capital), Cordoba (Mezquita) and Seville (vibrant and sophisticated) with a rent a car. Visit cosmopolitan Barcelona (The fantastical Sagrada Familia church and other modernist landmarks designed by Antoni Gaudi dot the city), historical Cordoba (It`s best known for La Mezquita, an immense mosque dating from 784 A.D., featuring a columned prayer hall and older Byzantine mosaics), sophisticated Seville (Major landmarks include the ornate Alcàzar castle complex, built during the Moorish Almohad dynasty, and the 18th-century Plaza de Toros de la Maestranza bullring) and exciting Madrid (It`s renowned for its rich repositories of European art, including the Prado Museum`s works by Goya, Velàzquez and other Spanish masters) with the Ave Train between cities. This is a flexible vacation package. Select your number of nights in each city, desired hotel and activities. This self-drive vacation package lets you set the rules! 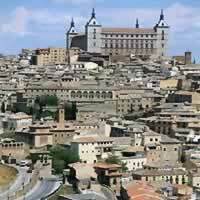 Sample some of Spain`s most popular cities. Visit exciting Barcelona, then pick up your car and drive to Valencia and to Alicante on the Mediterranean continue to Granada and the Alhambra and then sample the Costa del Sol with a stay in Marbella, proceed to beautiful Seville. Drop your car there on arrival and finally catch the Ave train for a visit to artistic Madrid. With yourself in the driver`s seat you can choose which museums, churches, historic sights, beaches and more that spark your interest, for ultimate control of your vacation. This is a flexible vacation package. Select your number of nights in each city, rental car, desired hotel and activities. All hotels and transportation were exactly as described. Everything was as advertised. The trip as a whole was a great experience for my family. I would definitely book again!